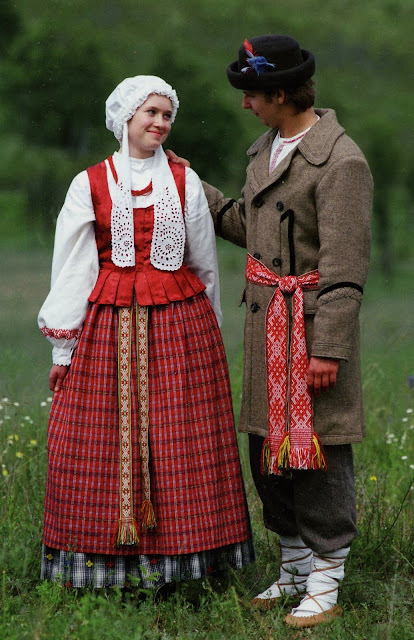 I will continue our survey of Lithuanian costumes by travelling east into Dzukija, [Dzukia], also called Dainava, the land of Song.Dzukia lies in southeastern Lithuania. The cultural capitol of the region is Alytus. 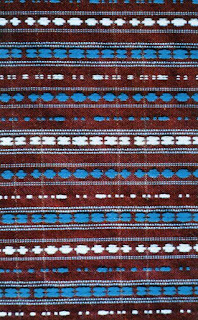 For more information see this article. 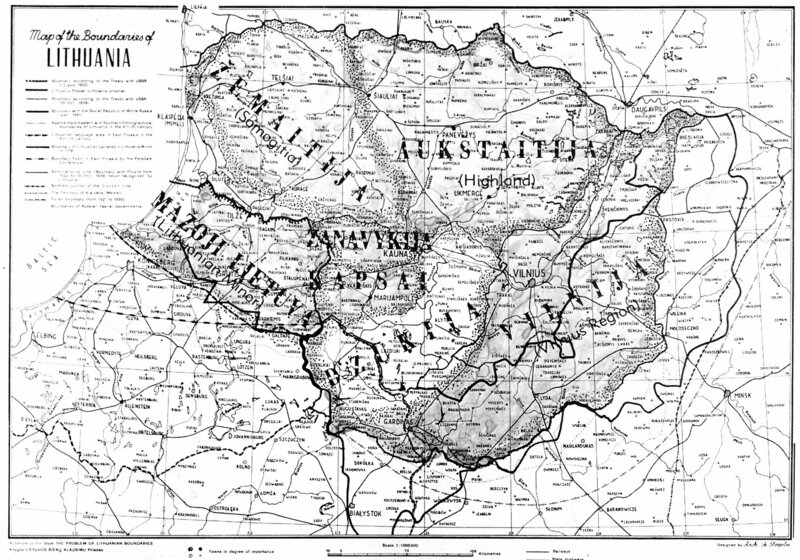 Here is a map showing Dzukia according to the 5 region system. 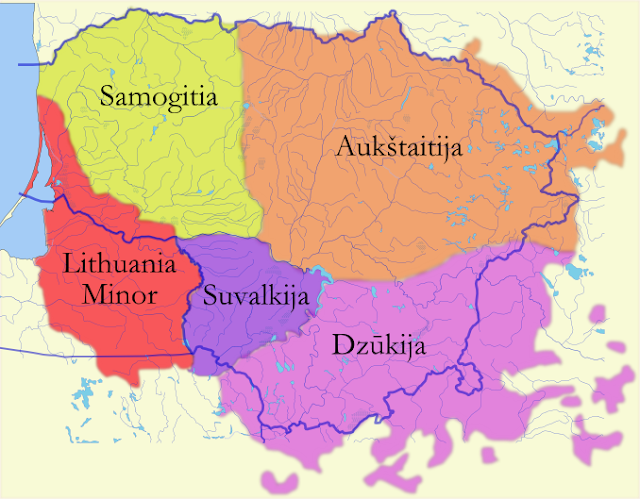 And here is a map showing Dzukija according to the seven region system. 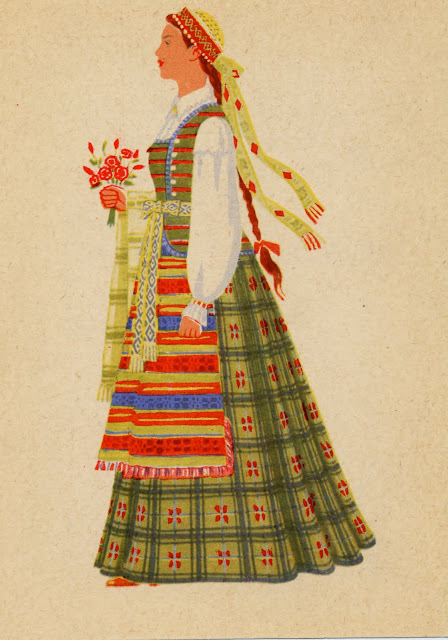 A couple of images from the recent book by Andrašiūnaitė. A photograph by R. Paknys. 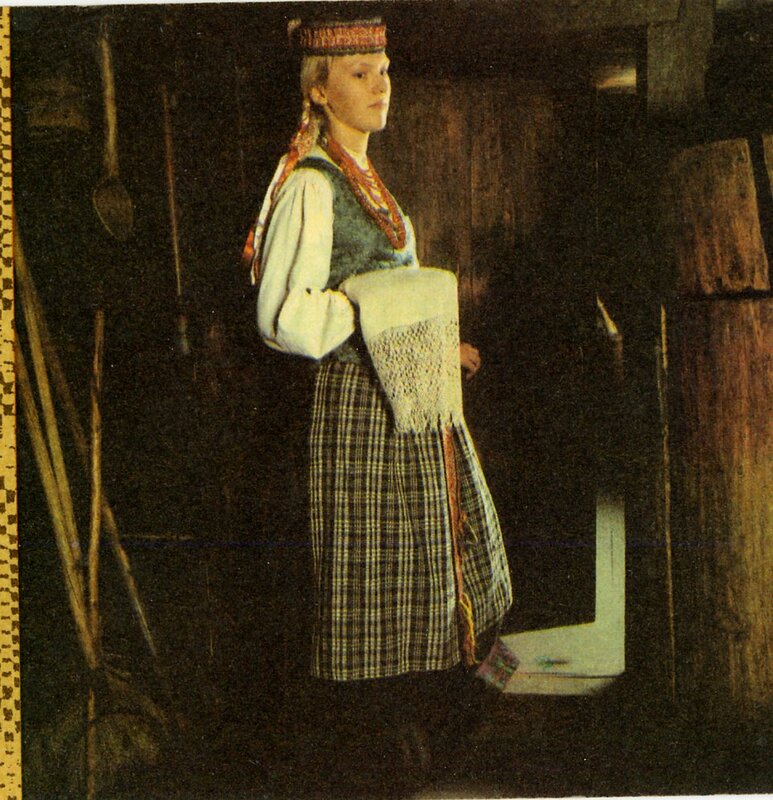 And a couple of images from Jurkuviene. 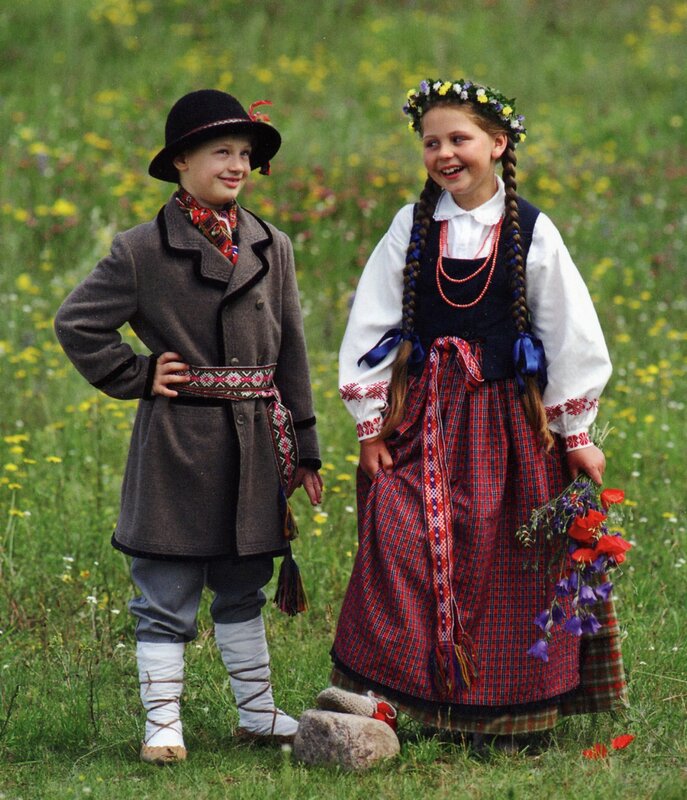 Notice the footwear, moccasins on the boy, and shoes looped or knitted from hemp or linen string on the girl. 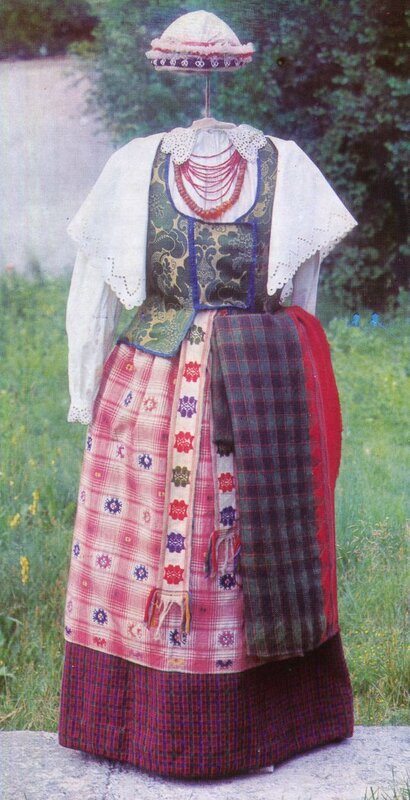 A couple images from Tamošaitis. 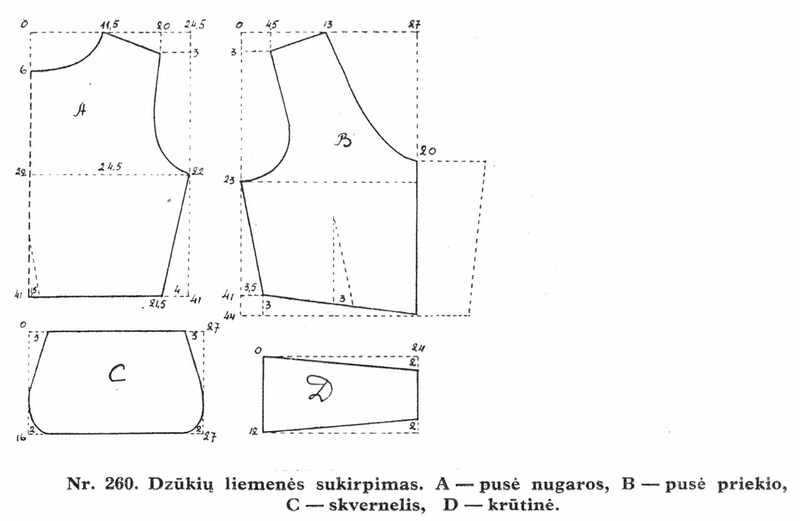 The chemise is the standard tunic type cut of LIthuania, with relatively narrow shoulder tabs. 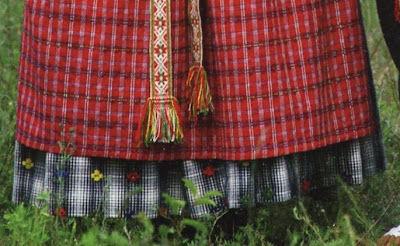 The lower sleeves often have woven ornament, see the various images in this posting. Here is the design woven into the sleeves of the girl shown just above. Here is a closeup of some pick up designs, most likely in red, woven into the sleeve of a chemise. 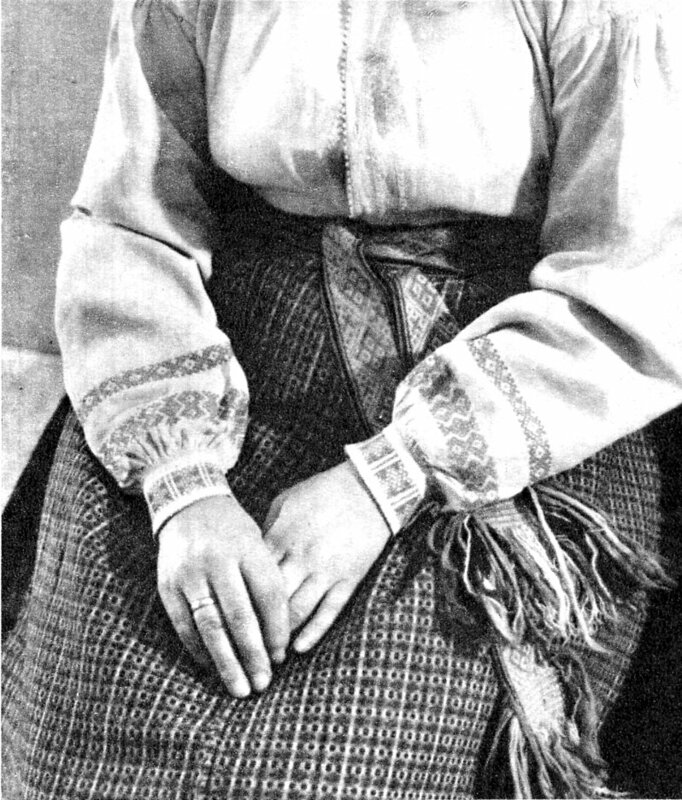 Dzukia, like Kapsai, has embroidery on the chemise perhaps more often than in other regions. 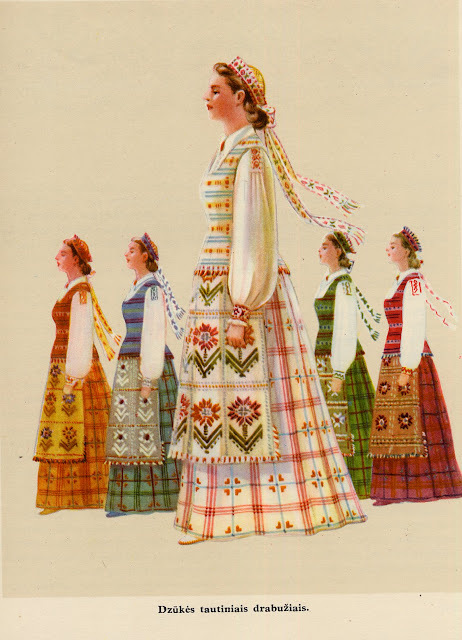 This may be due to proximity with Belarus, where embroidery is just about universal in the folk costume. Here is a woman with very fine counted satin stitch embroidery on her lower sleeves and cuff. And some examples of the different kinds of embroidery used on the sleeves. 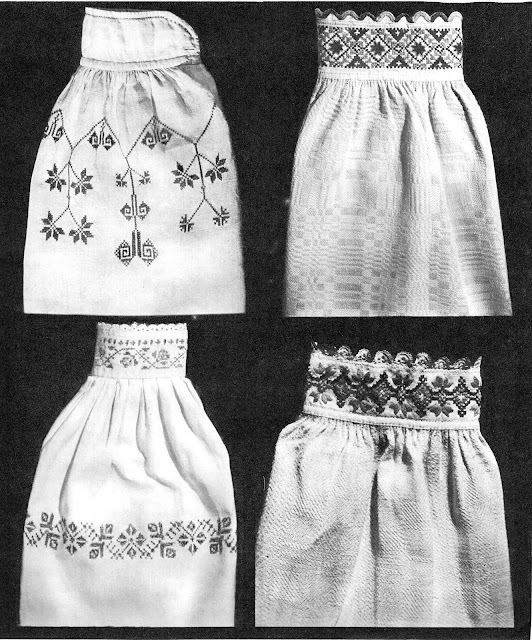 Notice that the linen in both of the sleeves on the right have been woven with a pattern. Broderie Anglaise was also popular in this region for chemises in the late 19th cent. The skirts, as the most casual perusal of the images in this posting will show, were overwhelmingly made of plaid. 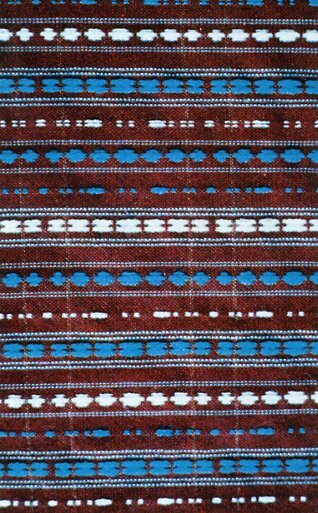 One characterisic of all the weaving in this region is the inclusion of small float patterns placed linearly in the weaving, and also isolated overlay patterns woven into the basic plaids. Here is an example of the first. 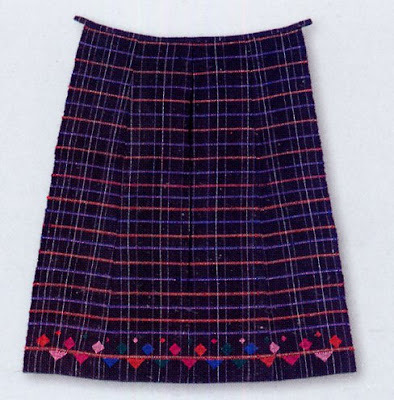 If you look carefully at the skirt, you will see the overlay designs individually woven on top of the plaid in the skirt. 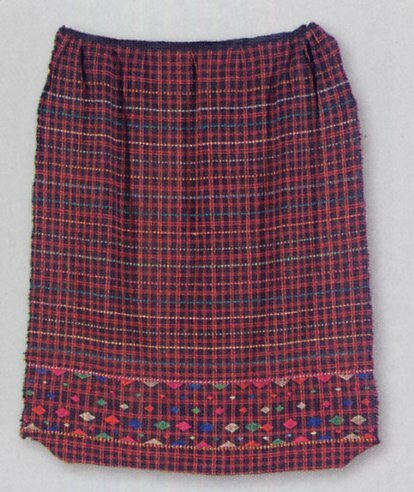 Here is a closeup of the skirt. The apron takes center stage again in this costume. 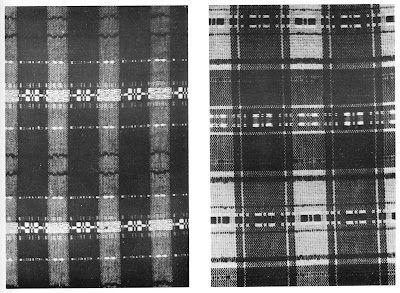 Most are of a small plaid design, but some other designs are used as well. Take another look at the various images. 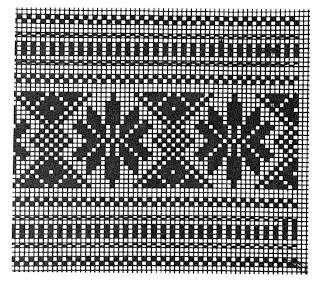 Dzukia is especially known for plaids with overlay designs woven in the squares, which is unique to this region. Another type of apron typical of this region has small vertical stripes or plaids, with overlay designs woven in contrasting colors above the hem. Here are a couple examples. 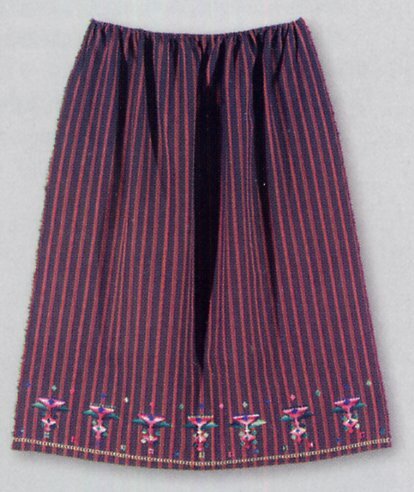 There are several other types of aprons worn in this region, but these are the most distinctive. 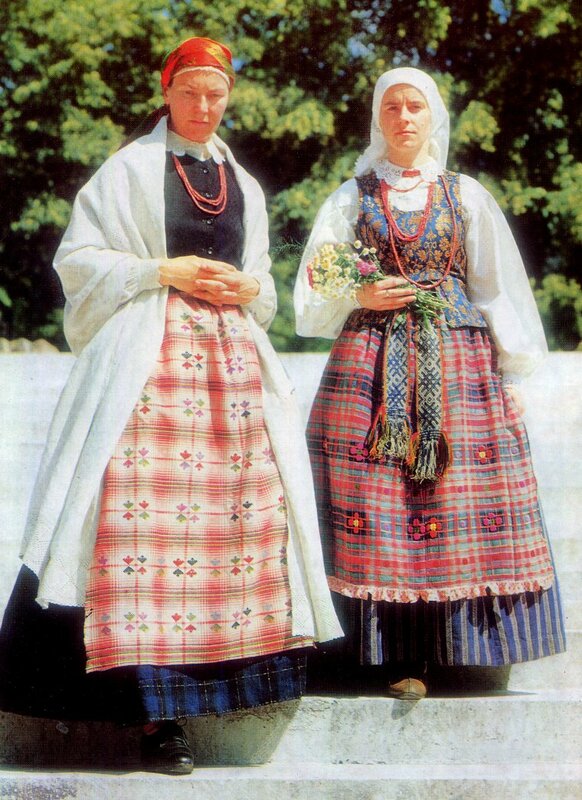 The sashes are typical for Lithuania, with elaborate pickup designs, or other woven ornament. 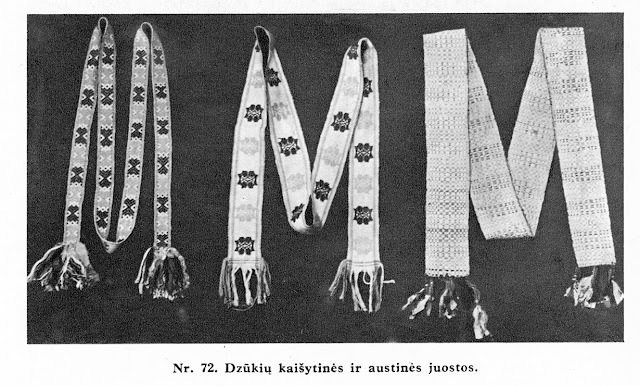 One type of sash unique to Dzukija is a white one with isolated self contained colored designs woven in overlay, placed at intervals along the sash much as they are on the aprons. 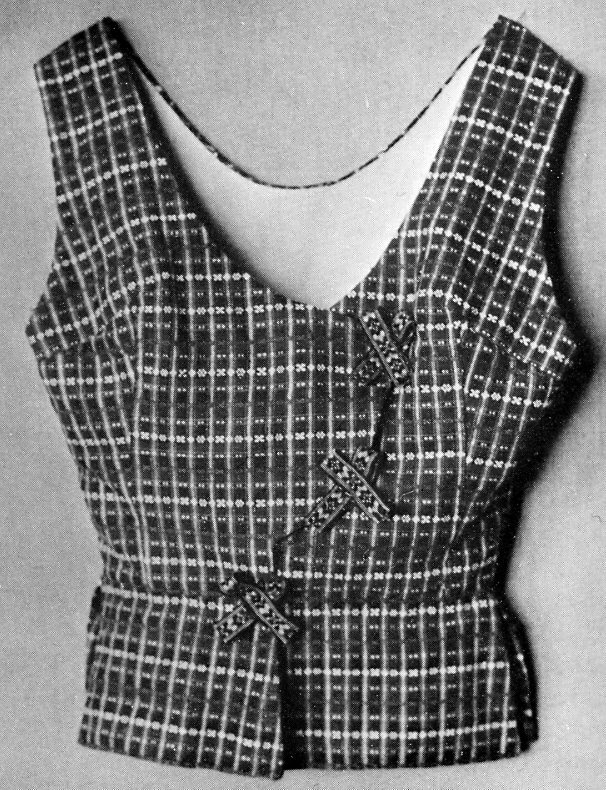 The mannequen just avove the aprons features such a sash, as do a few other images in the posting, and the two sashes on the left in this image. There are several cuts of bodice used in this region, as you can see from the various images, but the two most distinctive to the region are distinguished by side closure. 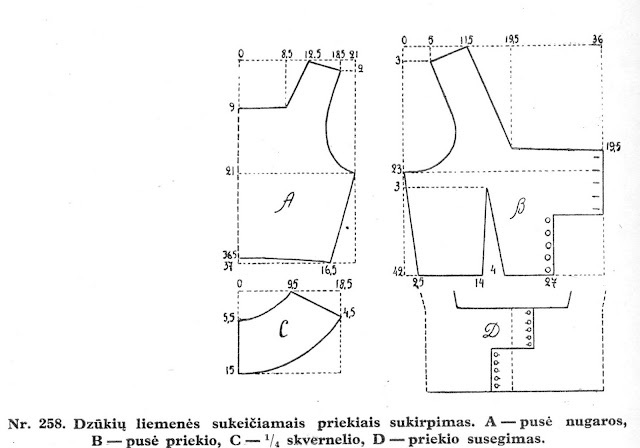 Here are the patterns for these two types of bodice. 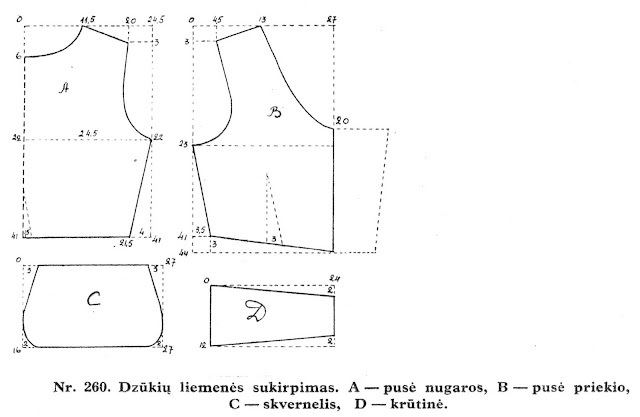 The first tyope has four large lappets around the waist, but none in front, where a panel covers the front down to the waist and attaches at the side, C is is one of the lappets and D is the front panel. 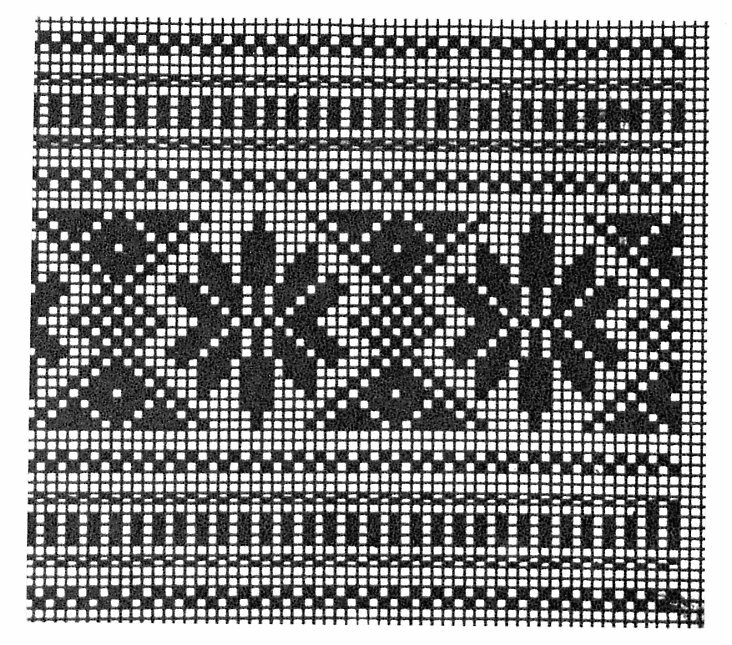 You can see this cut in several of the images above. Either of these cuts are made either from home woven cloth, like the following example, or from brocade or other expensive bought material, as in the images above. 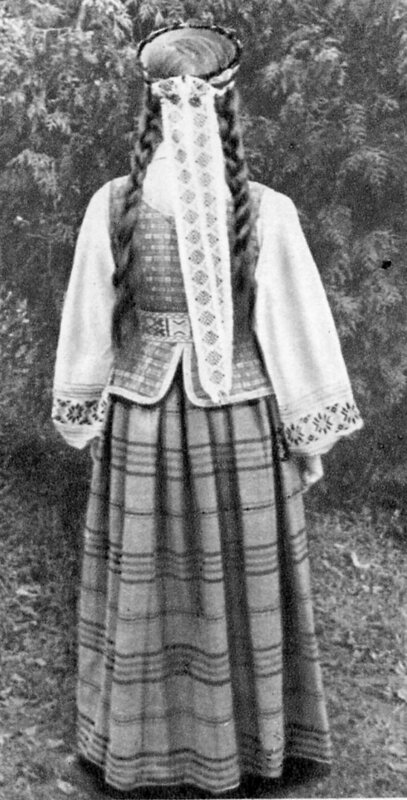 The headcoverings are similar to those we have already covered in Kapsai. 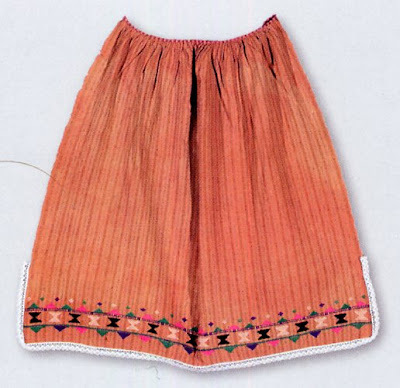 The costumes are completed with necklaces of amber, coral, or glass beads. 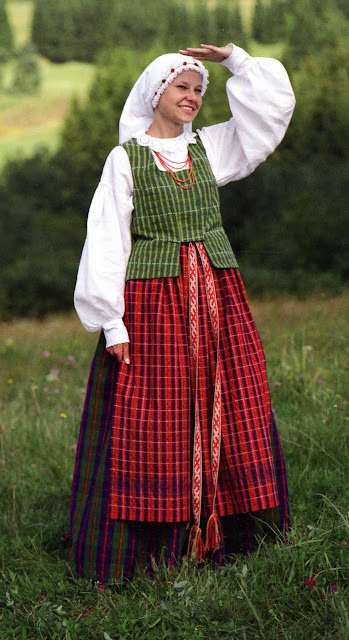 Thank you for reading, I hope you have found this interesting and maybe even inspiring. 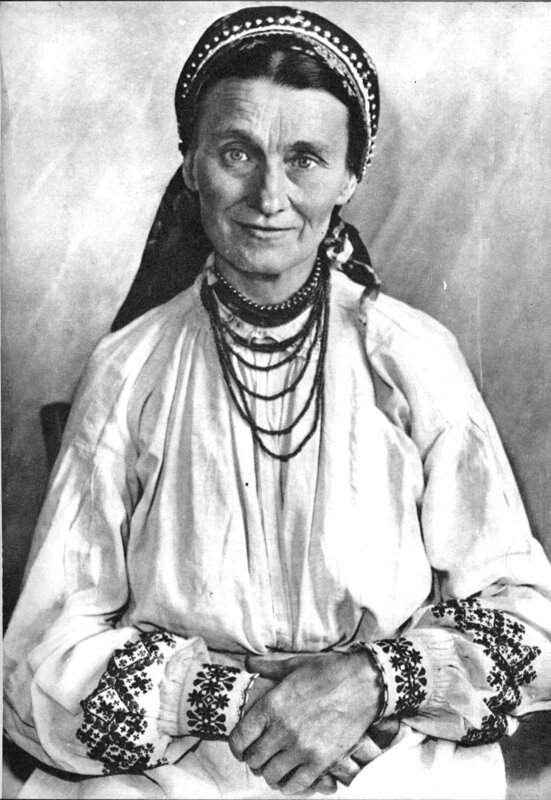 For more information, you can reference this article by Jurkoviene.